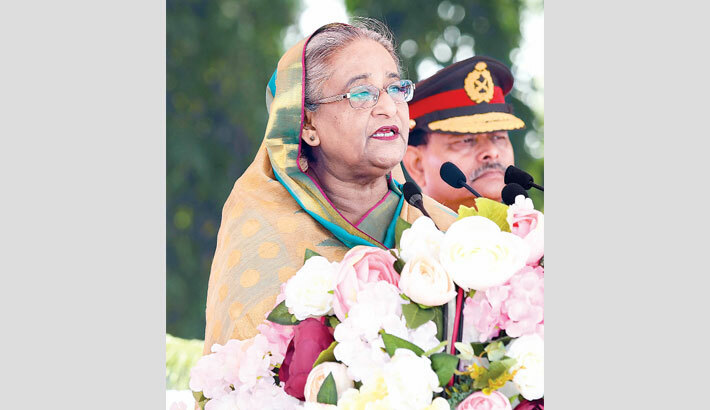 RAJSHAHI: Prime Minister Sheikh Hasina on Sunday asked the Bangladesh Army to remain always ready to unitedly face internal and external threats for protecting the constitution and the sovereignty of the country, reports UNB. “You’ll have to be always ready to unitedly face any internal or external threat for protecting the holy constitution and the sovereignty of the motherland,” she said. The Prme Minister was addressing the ‘National Standard’ Awarding Ceremony to four battalions of Bangladesh Infantry Regiment (BIR) of the Bangladesh Army in Rajshahi Cantonment. She conferred the ‘National Standard’ upon the 7th, 8th, 9th and 10th Bangladesh Infantry Regiments in recognition of their excellence, hard practice and dutifulness. Hasina thanked the Army members for playing a significant role in upholding the democratic process by performing their duty sincerely in the 11th parliamentary election. She also expressed her gratitude to the country’s people for giving the scope to her party to form the government for the fourth term, and the third term in a row. “Our government wants to govern the country as the servant of people, not as the ruler,” she said. The Prime Minister said the Army is engaged in nation-building activities like construction of Padma Bridge and Cox’s Bazar-Technaf Marine Drive, alongside their main duty. She said Bangladesh Army earned rare dignity and image for Bangladesh through their sacrifice, sincerity and professionalism in establishment of world peace and different foreign missions, which brightened the image of Bangladesh. She said a process is on to modernise the Bangladesh Army following the foresighted guidelines of the Father of the Nation. Hasina said she approved in principle the formation of Bangladesh Infantry Regiment in 1999 and formally hoisted the flag of BIR on April 21, 2001. “It’s the only regiment which was formed after the Independence of Bangladesh,” she said adding that now there are 43 units and two Para-commando battalions under the BIR. The Prime Minister said Bangladesh is marching forward and will continue to do so. At the function, an attractive parade of the four battalions of the BIR was also held. As the Prime Minister arrived at the parade ground, Chief of Army Staff General Aziz Ahmed received her. She inspected the parade riding an open decorated jeep and took salute. The Chief of Army Staff and the Parade Commander were also with the PM at that time. The Prime Minister handed over the National Flag to the Commanders of the respective battalions.